I’m watching PBS’s Saturday lineup of cooking shows right now as I type this, or half-watching I guess, as I often do. A few weeks ago I saw an episode of Gourmet’s Adventures with Ruth (Reichl) that was filmed in China. Ruth was dropping whisked eggs into a hot wok, spooning a filling in the centre and folding the now semi-set egg skin onto itself using chopsticks. 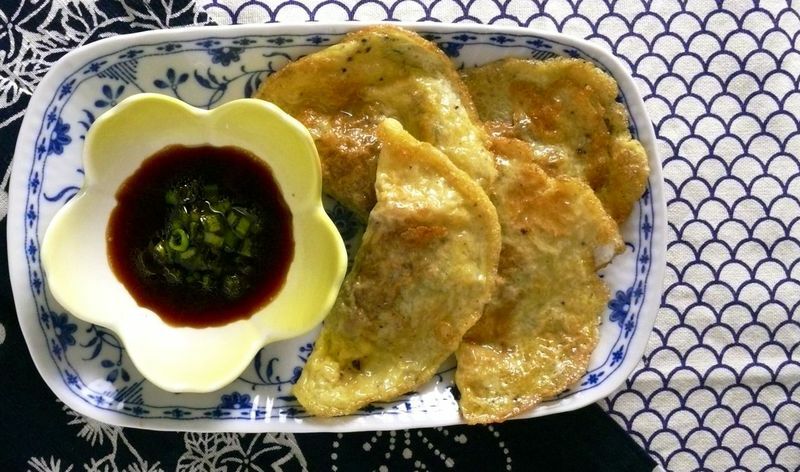 A dough-less or rice paper-less dumpling! Both the novelty (to me) and ease moved me to go directly from the couch to the kitchen and attempt to recreate it. There was no recipe provided (though the recipe for the chicken-filled dumplings she made is now online) but I really didn’t think I needed one. It was such a simple idea and technique I’d witnessed that I felt free to attempt my own version. Consequently our recipes are nothing alike though the result is basically the same. You should feel as free to make your own version of this too. I’d say that once you’re in control of the heat and as long as you have a finely minced and concise filling, you can’t go wrong. I’ve been making a version with a scallion and mushroom filling, which I’m sharing with you here. Next, I want to try a kimchee filling and maybe a turmeric-spiced, fried and mashed potato filling for a sort of Southeast Asian egg perogi. As we enjoyed yet another batch, I asked James just what was it that was so great about these. “They’re mini-omelettes”, he said matter-of-factly. Mini Asian omelettes, I’d add, but yes, exactly! First, make the sauce: add the tamari, vinegar, 1/2 tsp of sesame oil and a pinch of the sliced scallions–mostly the green part–to a small bowl. Mix well and set aside. In a small skillet, heat 1 tbs of oil over medium high heat. Add the mushrooms, the remaining chopped scallion, chili (if using) and 1/4 tsp of salt. Sautée until the mushrooms have released their liquid and dried, but do not overcook. Sprinkle with the remaining 1/2 tsp of sesame oil, stir it through, remove the mixture from the heat and set aside. 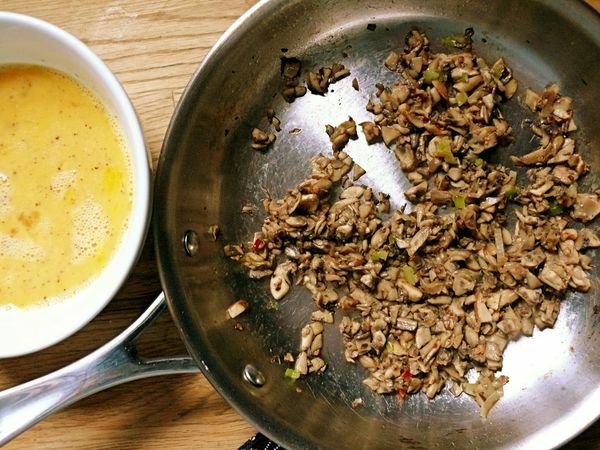 Whisk the eggs in a small bowl. Season with the remaining salt and pepper. In a non-stick skillet or a really well-seasoned wok or skillet, heat 1 tbs of oil over medium heat. 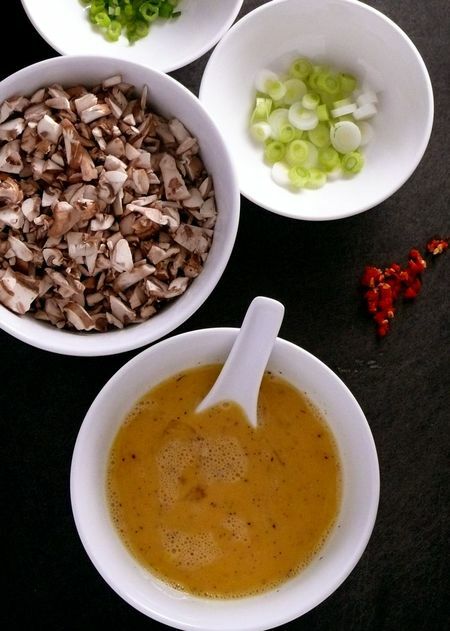 Dip a chinese soup spoon or tablespoon measure, into the eggs and drop one spoonful into the hot oil. Try to have the batter settle into a circle as much as possible, and immediately spoon 1/2 tsp-1 scant tsp of the mushroom filling in the centre. 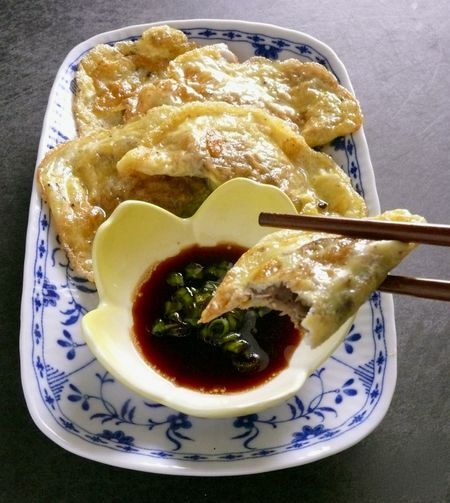 While the batter is still runny, fold the egg over the filling to make as even a half circle as possible (if you’re comfortable using chopsticks, they do work quite well for this) and gently pat the edges closed to seal them with the batter. Fry for 30 seconds until the bottom is golden, flip and fry for another 30 seconds until golden on the other side. Transfer to a paper towel-lined plate and repeat. Once you get the hang of it, make as many at a time as you can comfortably fit, fold and tend to without letting them bleed into one another or overcook in the pan. Serve with the sauce for dipping.